Remember how I said last time that the Scots were starting to expand, and had gotten themselves a foothold in Ireland? Well, they've decided to push right up to my borders. I have a feeling that the only thing keeping them at bay right now are all of the political marriages that my family has. If Scotland were to invade I'd have my pick of a number of powers to ask for help in trying to repel them. Perhaps they're not be keen on getting in war that may see them fighting the likes of France, Norway, Sweden, Castille, and the Byzantine Empire. So, I think I may have time on my side for figuring out what I want to do in order to deal with the Scots. Before that, though, I've got another problem to sort out. Enri's eldest son is still off fighting the Crusades, and has sworn fealty to a foreign power. For a time it looked like he would be ineligible to take over Connacht, and Enri's second son, Coleman, would be the next duke. However, that's no longer the case, as Emich managed to get himself back in line for the throne. With that I managed to convince him to return to my court, and a few years later Coleman hatched a plot to have his older brother killed. I knew about it and could have had Coleman arrested, but I chose to look the other way because I wanted Emich dead as well. Things haven't been entirely grim, though. I've had another bishop go heretic on me, this time Enri's own brother who decided to embrace Lollardism. 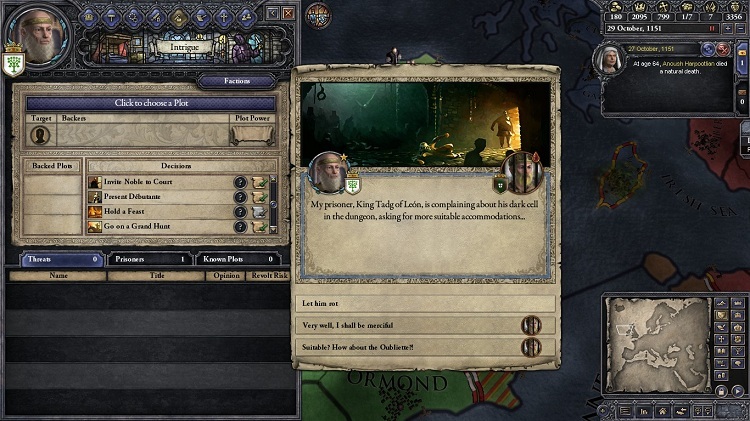 I promptly tossed him in prison when he told me this, and after a few years he had the gall to complain that his accommodation weren't up to snuff, and that he wanted something nicer. I told him to stuff it. After a time he died in there since he absolutely refused to convert back to Catholicism. Sad. But on the plus side, his death freed up a landed title which I gave to Coleman since he was still my heir at the time. So, I've got a lot to work on next time I play. First and foremost is wiping out the last of Emich's family. 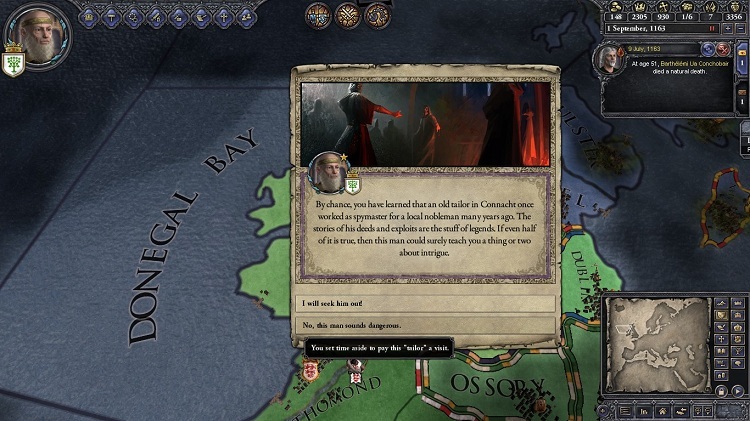 I don't want Connacht falling under Enri's grandchildren's liege's control. After that it'll be time to deal with Scotland. Thankfully after hopping on the Paradox forums, the people there gave me a bunch of nifty tips for dealing with a larger, aggressive nation that's on your borders. I'm liking the idea of trying to assassinate the King of Scotland, and a few of his successors just after they take the throne. If I can pull that off and create a lot of instability there, I'll be quite happy. 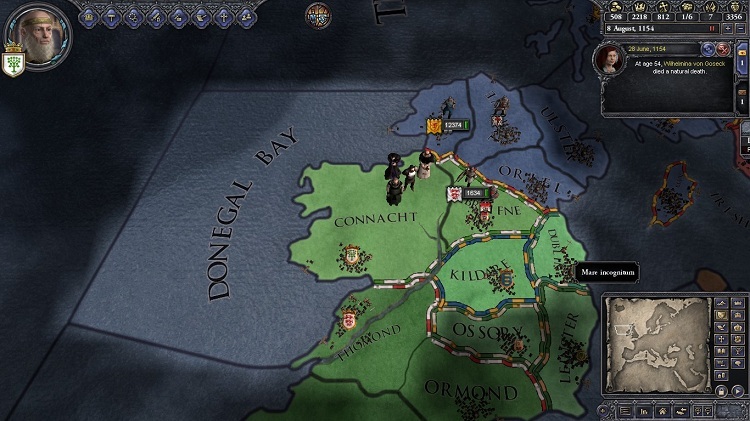 I'll also need to start thinking about expanding into southern Ireland to increase the size of my own army, and just because it's something I want to do in this play through. My levies are getting pretty big, and I'm pretty close to being able to create a retinue, so maybe it's time to expand again soon. Despite a lot of things potentially going wrong the last little bit, I'm really enjoying this, as I'm seeing that there's a lot more layers to this game the closer I look at it.